Sticker Tales App is a free fun or play learning Windows 8 game app that allows users to create their own beautiful scenes using available virtual stickers and scenes like summer, winter, and spring. 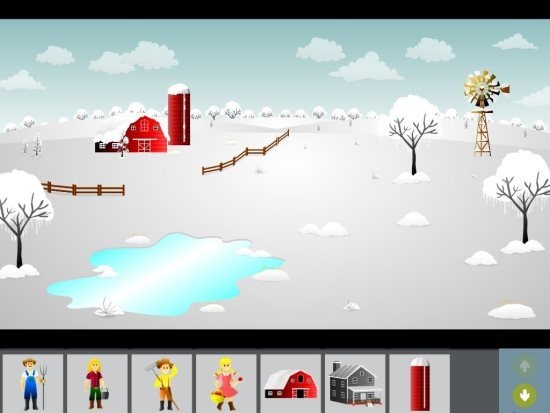 This game app for Windows 8 offers all the stickers and scenes related to farm. Lets you create your own scenes by using virtual stickers. Offers Game category in which several games are available. Offers various scenes like winter, summer, spring under Scenes category. You can even edit scenes any time when you want. Windows 8 Sticker Tales App has been divided into three categories such as Scenes, Game, and My pictures. Within Scene category, you will find the various scenes like Spring, Summer, Winter, Fall and many more. One another option in Scenes category is ‘create your own farm’ in which users can easily create their favorite scenes using different stickers. You will find various games within Games category such as complete the pattern, color match, guess who, complete the picture and the like. In this category you have to place the correct sticker in the correct place. If you edit any picture then it comes under My painting category. Apart from this, you can rotate and resize the available stickers in the way you want. Sticker Tales App is a fun educational game app for Windows 8 to let kids show their creativity through play way method. Go ahead and try this Windows 8 app available under the Entertainment category.